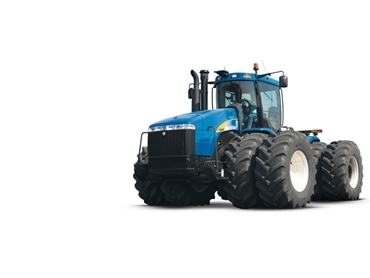 The New Holland T900 Series 4WD tractors are available in Australia from Black Truck Sales . These agricultural tractors can easily handle the harsh rigors of broad acre cropping and production techniques with horsepower ratings of 335, 385, 435, 485 and 535 hp. All the agricultural tractor models from the T900 Series feature 24-cylinder head, with four valves per cylinder, increases the size of the intake and exhaust, thereby producing better engine breathing and more rapid response time. These 4WD agricultural tractors are fuel efficient by design with an electronic fuel control system that delivers the ideal amount of fuel only when it is required. The featured cab cruise control uses simple toggle switches provide consistent engine speed even during heavy tillage operations.